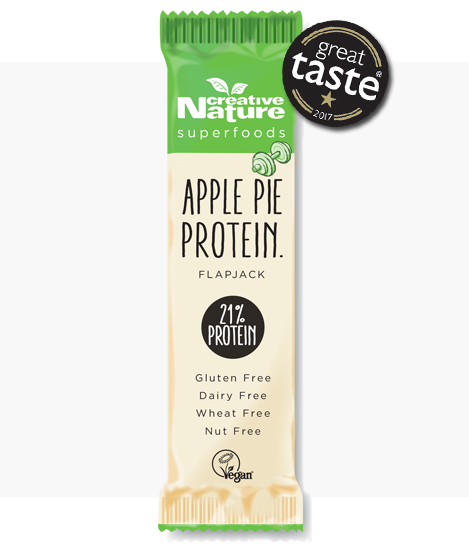 The Creative Nature Apple Pie High Protein Flapjack is the 1st High Protein snack bar to ever win a Great Taste Gold Star! 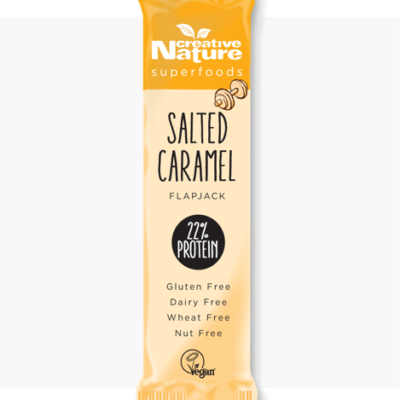 It is a gorgeous Spiced Apple Pie flavoured Protein snack bar that tastes so good it could be fresh out of Grandma’s oven! Stop forcing yourself to eat the same old protein snacks packed with additives, sweeteners, nuts or worse! Add a bit of joy to your gym session with something that tastes good, does good and has over 20% protein per bar, which will keep you fuller for longer but will also aid in muscle recover when consumed after a workout! We’ve given this Creative Nature Apple Pie High Protein Flapjack a Social Media tag, so be sure to use #IAMACTIVE when posting up pics and inspiration online so like minded people can join in the conversation. We’ve chosen this powerful tag because change is all up to you. You can choose to change your life by eating healthier, exercising more regularly and letting go of stress. You can help changes lives around you by encouraging positivity, treating people the same as you would expect to be treated and doing random acts of kindness. Healthy eating and living is a community, so let’s build ours together! Peel back the wrapper and enjoy Grandma’s homemade Apple Pie! I often steer clear of flapjacks in general because I find them terribly sweet. On reading reviews for Creative Nature’s apple pie flapjack I thought I’d give it a shot. Although the flavour is alright, I still found it way too sweet for me. I think it would be better and probably healthier to up the plant protein (maybe more pumkin seeds & flaxseeds) and reduce the fruit sugars (currently 14g per bar). 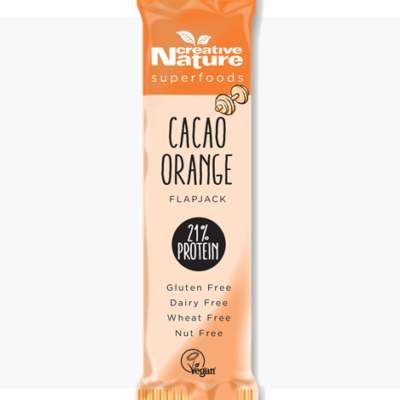 I’ve rated the product ‘good’ instead of ‘average’ primarily for the high protein content and use of natural – rather than synthetic – fruit sugars. Hi Cee, thank you for your feedback on the bar, we are always looking to cater for customer needs so will take your comments on the sugar into consideration and might tweak the recipe in the future! PSA: YOU HAVE TO EAT THIS. I wasn’t really expecting much from this bar… but boy was I wrong! This is easily the most delicious snack bar I have come across to date. The flavoring is perfectly balanced and there’s nice crunchy chunks in it too! I’m definitely going to head by the supermarket on my way home to stock up! I’m not normally keen on these kinds of bars, but this one was really tasty. Great flavour, nice texture and left me feeling satisfied. I’m looking forward to working my way through the other flavours. I had one of these recently and it was great. I was looking for something that was veggie and high protein. The apple pie flavour was really nice, not too strong and not too sweet. I’ve heard good things about the salted caramel too, so that’s next on my list.